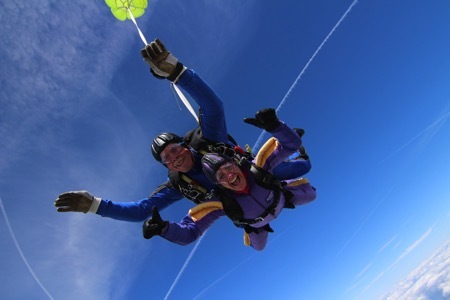 Shake off those winter blues and plan an exciting summer skydive with Princess Alice Hospice. Tandem sky-dives, where jumpers are safely strapped to a qualified instructor, will be taking place throughout the summer in aid of the Hospice. It is an exhilarating experience and places always go fast. Emily East from the Hospice’s Fundraising Team explained: “It’s a great way to try a first skydive and people often say they want to do it again as soon as their feet have touched the ground! “Some of our fundraisers are fearless thrill seekers, after-all jumping from a plane at 10,000 feet is quite an adrenaline rush! Others simply want to overcome a fear of heights and prove to themselves that they are braver than they thought. “They are all united, though, in wanting to raise money for the Hospice. Every jump really does make a difference to us. “These are always very popular fundraising events so if you’ve ever thought about giving skydiving a go, now is the time to get your name down. Registration is free, with the skydivers pledging to raise £395 in sponsorship. The skydives will be taking place on Sunday 12 June, Sunday 7 August and Sunday 18 September. 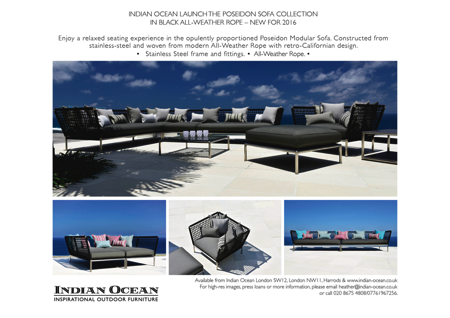 Now available from Indian Ocean, London SW12, London NW11 and Harrods. Visit www.indian-ocean.co.uk for more information.